With gardening catalogs showing up in my mail box, and next year’s garden already on my mind, I dug into my archives to find older posts on gardening. I haven’t seen many folks talking about winter sowing which I tried one year. I thought I’d throw it out there to see if others have tried this method of seed starting. I was able to do all my winter sowing during afternoon nap time yesterday. I did about 90 percent vegetables. I have some gallon milk jugs in the garage which I’ll be using for flowers. I decided to try this method this year because it doesn’t require electricity. I’ve been saving pots from my store-bought plants for several years now and was able to use all of them today. In fact, I almost kicked myself for my decluttering of the pots in the fall. I did not put plastic bags on as described by the Winter Sowing site. My plan is to keep an eye on things and decide later if I want to put the plastic bags on. I also have some storm windows given to me that I could place over top of the pots, supported by our collection of bricks. Trudi Davidoff of Winter Sowing talks about having an 80% success rate. I’m hoping to have the same rate with my lazier version of seed planting. If any of the seeds don’t germinate, I’ll use those pots to start my fall vegetables. 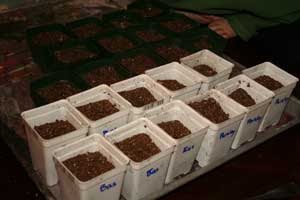 Have you tried winter sowing or alternate methods of seed starting? Thank you for sharing this! I was just telling my husband yesterday that I wanted to try growing some lettuce in the house this winter instead of having to buy it at the store. This totally inspires me to do it during our baby’s nap today! I recently had my husband make a shelf for me in front of our large living room window. I’m starting herbs on it now! Love having stuff in the house during the winter months and not having to buy it all. This is a great idea. I love fresh herbs. I have a link party called Wednesdays Adorned From Above Blog Hop and would love to have you share this with everyone. It runs from Wednesday through midnight Sunday. Here is the link to the party. I want to be good at gardening, especially in containers, as we’ll be spending may-August in a different city and could take them with us. I haven’t done any seed starting before. It’s always on the goal list, but I always end up buying plantlings or direct sowing in the spring. Don’t laugh, but I had no idea you could start an indoor garden. I feel like maybe this would make me more likely to succeed? I have an awful history with gardening. As much as I *want* to grow our own herbs and veggies, I just can’t seem to make them work! Now I’m inspired to learn more about this. I’ve got a black thumb, I always seem to kill everything I attempt to plant. Surprisingly I have two plants actually growing on my windowsill…we’ll see how long they last! I really wish I had a place to do an inside garden. I cannot wait to start my garden next spring though.